← Marketing Summit by New Patients Inc.
Seth Godin has long been one of my favorite marketing authors. I’ve subscribed to his blog for quite a long time. And, I’ve read most of his books. 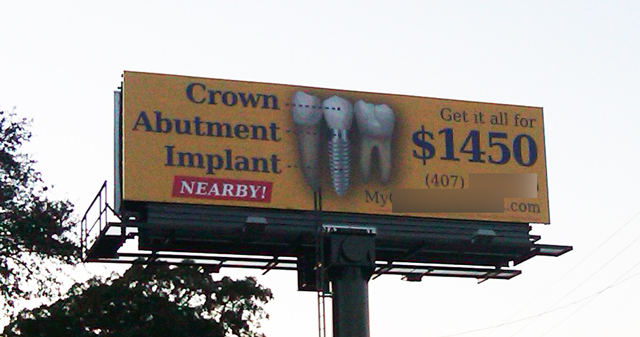 I highly recommend them for my fellow Dental Warriors. Godin talks about two markets… the one based on price and the one based on value. If you’re not the lowest price, AND you don’t want to race to the bottom by competing with the lowest price, then you MUST create VALUE. To create value, you must tell stories – something I’ve long advocated as it pertains to copywriting for websites. So, do you want to race this guy (see below) to the bottom? Can you even afford to race him to the bottom? This was also part of the discussion at NPI’s Marketing Summit last weekend. I took this photo last weekend in Orlando. Or do you have some stories to illustrate why your service has more value than this? A big part of being a Dental Warrior is being a Marketing Warrior. Create value by telling powerful stories. This entry was posted in Marketing and tagged advertising, marketing, website marketing. Bookmark the permalink.